Open back shelving is a great option for people who need a storage unit that is easily accessed by either the front or back. Open shelving units are sometimes referred to as etageres and they have been popular for many years. Antique versions can sometimes still be found. They can be used anywhere in residential homes to store and display books and accessories, in garages to store tools and garden items, or in storage areas to hold boxes and files. The decision whether to purchase open or closed shelves will depend on your needs. When items need to be more protected and a more finished look is desired, closed shelving is likely preferable. If more accessibility and a lower price is a priority, open shelves might be the right decision. While closed shelves utilize panels to enclose the backs and sides of the shelving unit, giving it greater stability, open back shelves sometimes need a back brace to prevent them from swaying. If this is the case, the unit will need to be placed against a wall. Sturdier and better quality versions of open back shelving units will stand just fine on their own and can be placed anywhere. When this is the case, open shelving units become much more versatile than the closed variety. 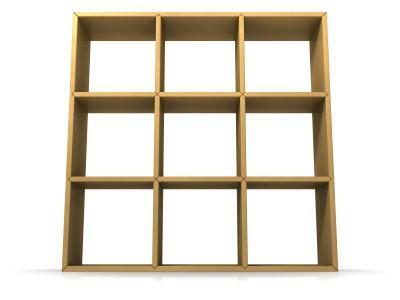 Quality open back shelving units have many advantages over the closed variety. Because they are open, items can be accessed from the front and back. That's why so many people use them in storage rooms. More units can be put in a room, maximizing space and providing more storage. For residential use, open units can make great room dividers, particularly in small spaces. In a small apartment they can be used to separate a living and dining room, or in a bachelor apartment they can separate the sleeping area from the rest of the apartment. With the right combination of accessories and design, open shelving units combine function and style in the best possible way. Because items can be seen from both sides, items always have to be displayed in a nice way. Even the neatest people can find that when not careful, storage can quickly become clutter. You can't really hide items on an open shelf. Also, whereas with closed units you can install doors that can be opened or closed, open units will always be exposed. Open shelving units make it harder to hide wires from televisions and stereos. With closed units a hole can be drilled in the back and the wires can be pulled through, but with open units they just hang down, totally exposed. More care has to be put into hiding them. Prices vary greatly so decide ahead of time how much you're willing to spend. Measure the area where you want it to go and be sure of the dimensions before purchasing. If you're using it as a room divider, pay close attention to the depth. You don't want it to be too big and overwhelm each side. Have an idea of what will be put on the shelves. Extremely heavy items will need a sturdier unit with extra support. An open unit that sways a bit is not good for heavy items. Have an idea of the style you want before you go shopping. You'll be less likely to make a mistake. If you get one with adjustable shelves it might be worthwhile to purchase an extra shelf or two. You may want additional storage later and might not be able to find shelves that fit. Plenty of furniture stores offer open shelving units for sale. Large stores like IKEA always have something in stock. You can also try home improvement stores like The Home Depot if you're looking for something to put in a garage or stockroom. If you can't find what you're looking for consider contacting a contractor or furniture builder and have one custom made. If all else fails, build your own!